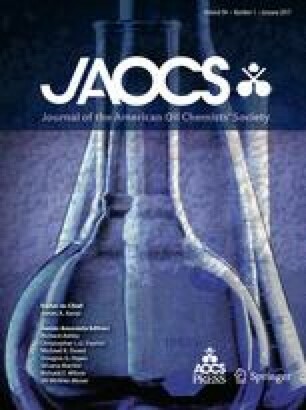 Determination of the minimum inhibitory concen-trations (MIC) of 212 common soap fragrance raw materials demonstrated that the paper disc-petri plate technique does not reflect the relative anti-microbial activity of these materials. Commonly used soap bacteriostats were shown to be 100 to 1000 times more effective than the most active fragrance materials. Of 521 fragrance materials initially screened by the petri plate method, 44% were inhibitory against one of the three test organisms, and 15% were effective against all three(Staphylococcus aureus, Escherichia coli, Candida albicans). Of a selected number (212) of these positive materials, subsequently screened against a lipophilic diphtheroid organism(Corynebacterium sp. ), 64 materials (30%) were positive against all four test organisms. However, only nine materials (4%) had a MIC as low as 50 ppm compared to the common soap bacteriostat TCC, which had a MIC of 0.08 ppm (vs.S. aureus). In hand-degerming tests, no reduction of bacterial counts was obtained with a soap containing the most active fragrance materials. These results demonstrate that creation of a practical antimicrobial soap fragrance does not appear to be possible. 1Preliminary report presented at the 1976 national meeting of the American Chemical Society, Miami Beach, FL, September 1978.